I use precision oriented techniques to achieve a cut that works with your hair's natural texture and movement. I don't see styling as necessary and I believe hair should be effortless without compromising style and self expression. In this appointment I will weave energy work, sound and an intention for healing into the normal haircut experience. I believe this beauty ritual can be used as a powerful tool for accessing self love through self acceptance. By working with the hair's natural form, instead of against it, we access it's most beautiful healthy state and show ourselves love and care. I believe hair is a unique art form because of its ability to work with and transform over time. I focus on creating longevity in my haircuts, so you only have to come in for a new cut when you are feeling ready, not because you have to. In order to extend the life of the cuts I give I also offer "touch-ups". I customize this for each head of hair, whether it is trimming the bangs, cleaning up the neckline or slicing through some unruly curls, the goal is to extend the life of the cut and leave you feeling a bit fresher. 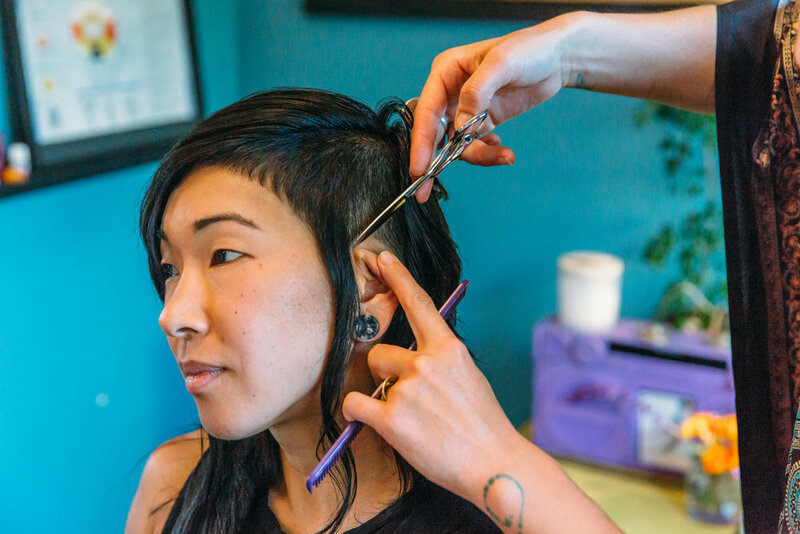 Touch-ups are a great way to imbue your cut with new life while still allowing time for the cut to grow. In order to provide an alternative to the standard industry color practices, I have begun to incorporate herbal color treatments, mixing Henna, Indigo, Amla, Cassia and other all natural ingredients to create individual blends that nourish the scalp and hair while enhancing the color and shine. I love this incredibly grounding and ancient self care act. Herbal color masks can help to connect us deeper to the earth and to the beauty that is all around us.